Abstract: In many social science experiments, subjects often interact with each other and as a result one unit's treatment influences the outcome of another unit. Over the last decade, a significant progress has been made towards causal inference in the presence of such interference between units. 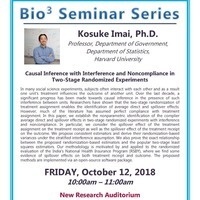 Researchers have shown that the two-stage randomization of treatment assignment enables the identification of average direct and spillover effects. However, much of the literature has assumed perfect compliance with treatment assignment. In this paper, we establish the nonparametric identification of the complier average direct and spillover effects in two-stage randomized experiments with interference and noncompliance. In particular, we consider the spillover effect of the treatment assignment on the treatment receipt as well as the spillover effect of the treatment receipt on the outcome. We propose consistent estimators and derive their randomization-based variances under the stratified interference assumption. We also prove the exact relationship between the proposed randomization-based estimators and the popular two-stage least squares estimators. Our methodology is motivated by and applied to the randomized evaluation of the India's National Health Insurance Program (RSBY), where we find some evidence of spillover effects on both treatment receipt and outcome. The proposed methods are implemented via an open-source software package.